"Quick to make and tasty, this chicken recipe features Campbell's® Condensed Cream of Chicken Soup for a warm and comforting meal. Serve with broth-simmered rice." Heat oil in a skillet over medium heat. 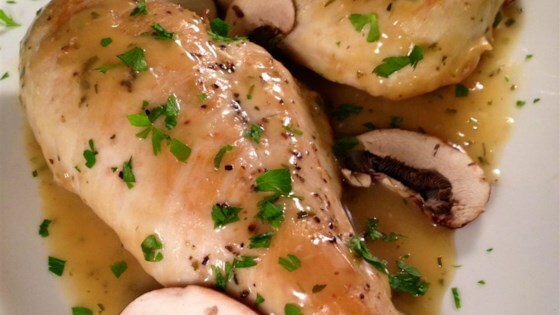 Cook chicken breasts in hot oil until completely browned, 3 to 5 minutes per side. Add soup, white wine, tarragon, parsley, garlic powder, and marjoram to the skillet; bring to a boil, place a cover on the skillet, reduce heat to low, and cook until the chicken is no longer pink in the center, 10 to 15 minutes. I added green beans and served over mashed potatoes! Mmmm good.